Mass with mixed languges readings and preaching in English. – After Mass there is a meal prepared by Nolwenn and Magda and someone more. – And then Sister Annmarie, Little Sister of Jesus in Copenhagen will shortly talk with us about her work with the feet of homeless people and protitutes in Copenhagen. 6.30 pm a nice meal together . 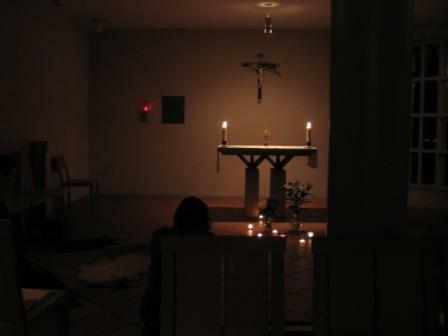 7.45 pm Introduction to adoration with br Björn – what is that, how could you handle your presence before the Sacrament? 8.30 -ca 10 Interactive acting workshop – Staffan Gerdmar, new deacon in our parish is also a theatre director and is working with people not used to act. Come in time! not possible to join later. 10 pm Singing – a song workshop presented by Aude and others. 11pm Painting – br Björn presents an exercise in painting that you can join all night individually- without previous experience of painting. and then: baking together, eating, and perhabs a film. You can come and go during this time and participate as much as you wish. We need though presence in front of the Sacrament all night. There will be lists exposed at Sandgatan (at the fridge in the kitchen) the coming week, so you can engage for blocks of 30 minutes. Bring good texts to read and pray with and notebooks to write important things in. Bring also a sleeping bag if you want to sleep part of the night in the room beside.